I was driving through an unfamiliar neighborhood on the way home yesterday after picking up scans for some client work. Off to my right out the car window I saw the flag (I always see the flags) and the fence and instantly the photograph formed in my head. I turned around, parked the car, grabbed the camera and went to work. A teenager was playing basketball on an adjoining driveway to the house. 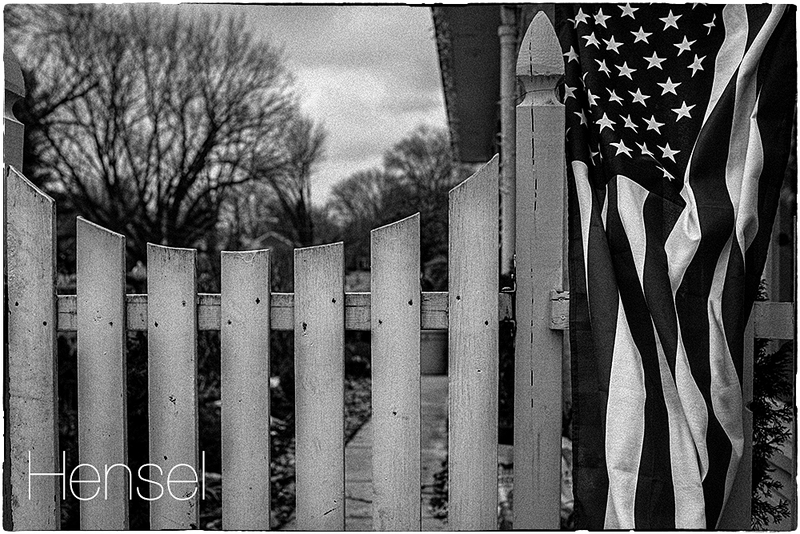 I smiled (always smile) and asked if he lived there, pointing at the house with the fence and the flag. He responded no and kept on shooting. I am always careful when approaching and entering private property in pursuit of a photograph. I stood on the sidewalk looking at the house, listening to hear any sign that anyone was in the yard or visible in the windows. There wasn’t. I set the exposure, walked up the path and clicked 4 or 5 times, recomposing slightly every time and opening the aperture from 5.6 to 1.4, changing the shutter speed appropriately. I was on the property less than 45 seconds. I was not surreptitious or sneaky, just quick. I stopped and shot a few baskets with the kid (I actually hit a few modest jumpers) and tried to convince him to try out for his high school basketball team. He had a nice little shot and could clearly play the game but had no interest in playing as the coach was a jerk. Okay then. I am very pleased with the resulting photograph. I was thinking of two images as I stood out in front of that house yesterday, the Bresson photo of an old woman draped in a flag, and a photo by Paul Strand: The White Fence, Port Kent, 1916. I have always overlooked the Strand image until recently when I had the occasion to view a print made by the artist. Simply brilliant. Incorporating the American flag in any photograph adds quite a bit, as everyone feels or thinks something when they view it. The combination of the picket fence (Mark Twain) and the flag proved irresistible. So this is the process, sometimes.